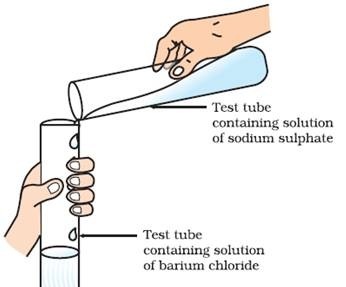 Take about 3 mL of sodium sulphate solution in a test tube. In another test tube, take about 3 mL of barium chloride solution. Mix the two solutions (Fig. 1.9). formed is known as a precipitate. Any reaction that produces a precipitate can be called a precipitation reaction. What causes this? The white precipitate of BaSO4 is formed by the reaction of SO4 and Ba2+. The other product formed is sodium chloride which remains in the solution. Such reactions in which there is an exchange of ions between the reactants are called double displacement reactions. Recall Previous Activity, where you have mixed the solutions of lead(II) nitrate and potassium iodide. (i) What was the colour of the precipitate formed? Can you name the compound precipitated? (ii) Write the balanced chemical equation for this reaction. (iii) Is this also a double displacement reaction?